Italians are taking part in a general strike organised by the country's largest trade union to protest against government austerity measures. The union, CGIL, called the strike after Silvio Berlusconi's centre-right coalition approved the measures. They include cuts in funding for local government and the freezing of public sector pay. 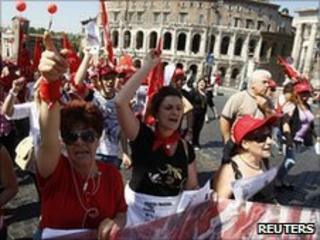 Rallies were held in major Italian cities, though two major unions, CISL and UIL, were not taking part. Tens of thousands of people turned out for the demonstrations in cities including Rome, Milan and Bologna. Private sector and public transport employees affiliated to CGIL were striking for four hours, while others in the public sector were staging a day-long strike. Some disruption to transport links was reported, with some flights cancelled in Rome and underground services affected in Rome and Naples. Like many European countries, Italy is struggling to lower debt and contain budget deficits amid slow growth. The austerity package that the government approved last month is worth 24bn euros (£20bn; $29bn) and covers the years 2011-2012.